Art and culture are transformative by nature. They are both drivers and a facilitative force in the achievement of sustainable development. Through the creative process, persons are empowered to take ownership of their own development and contribute to the advancement of a community both from a financial and a social perspective. In 2012, as we celebrated our nation’s 50th Anniversary of Independence, we took an introspective look at the level of national development and our achievements in the creative and cultural sector. From this analysis, we recognised the need for an approach that would combine the skills of our cultural masters and the new ideas and exuberance of upcoming practitioners. Hence the Mentoring by the Masters programme was born. The objective was to create a structured initiative that would facilitate the transfer of knowledge from senior, accomplished artists to emerging practitioners or apprentices in their respective fields. It was also a tangible way to recognize and acknowledge the contributions of these cultural icons who, through their dedication and patriotism, have contributed tirelessly towards the vitality of the Trinidad and Tobago culture. Over the past years, the Mentoring by the Masters programme has become a flagship of excellence in terms of the high caliber of distinguished mentors and the hands-on methodology utilized. I am proud to note that, between the 2012 to 2014 versions of the programme, the nuggets of wisdom imparted by our mentors have enriched the lives of one hundred and seventy-five (175) mentees. 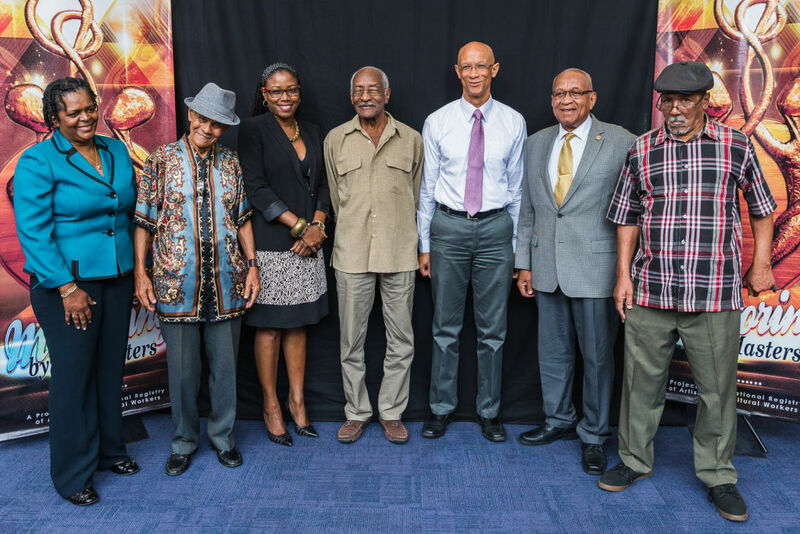 At this point, I would like to recognize the distinguished mentors of 2012 and 2014 programme such as Mr. Zeno Constance, Mr. Rodney Ramjitin, Mr. Krishna Persad, Dr. Kim Johnson, Mr. Errol Ince, Mr. Earl Lovelace, Ms. Renee Cummings, Mrs. Lindyann Bodden-Ritch, Mr. Joseph Valley and Mrs. Marina Salandy-Brown. Hence the goal of the “development of the cultural industries” is now overarching objective of the 2015 Mentoring by the Masters Programme. This adjustment will benefit the mentees by providing some of the important components required to manage a successful business in the creative sector locally and internationally. are delivered in conjunction with the other four pillars of development. These new modules are integral to the development of budding and existing entrepreneurs in the creative and cultural sector. as well as representation by the Trinidad and Tobago Film Festival in the area of Festival Development. By agreeing to participate in this programme, they have demonstrated their willingness to share their reservoir of creative and intellectual ideas and expertise with the future generation of Trinbagonians. Please let us recognise all of these cultural giants for their excellent work in using art as their vehicle to communicate the Caribbean perspective to the world. Distinguished participants, as you may have already recognized, you are being mentored by some of the best cultural entrepreneurs in Trinidad and Tobago. It is therefore the expectation of the Ministry that you will utilize the knowledge and experiences gained from the enriching dialogue and interactions with these distinguished icons to lead your creative endeavours with renewed vigour. You will be armed with the ability to successfully overcome various competing forces in order to make valuable contributions to the development of the industry. As you become more established in the future, it is hoped that you too will seek out opportunities to transfer your knowledge to the next generation, just as it had been passed to you. Always remember that the creativity you have been blessed with is a powerful tool …..it can transform lives. In closing, I wish to offer my sincere gratitude to the team at the Ministry and to the Mentors for 2015. Your efforts will enhance the technical capacity of budding artists and cultural workers in the local creative and cultural industry and ensure its sustainability.